Paul Ash breaking the American record (left) and winning gold in the Maccabiah Games in Israel (right) in 1961. Longtime Arizona Daily Star sports editor Abe Chanin* dubbed Paul Ash* the “strongest Jew in the world” and helped him raise some of the money he needed to go the Maccabiah Games in Israel in 1957. A military veteran and avid card player, Paul Ash raised the rest of the funds by winning card games as he criss-crossed the United States on the military transport flights that got him to New York in time to catch his flight to Israel. He won the first of his two gold medals that year in the sport of weightlifting, breaking all records in the 198-lb class. He competed and won the gold medal again in 1961. Paul joined the Army in 1946 when he was almost 16 years old. According to his son, Bruce Ash, Paul was a skinny kid from New York City’s lower east side who had bulked up during his time in the military when he began lifting weights. After his U.S. Army service, Paul won several state titles and began competing nationally in the 1950s. He was a two time National AAU Champion in the 198-pound class and broke an American record in the press during a 1961 contest. When he retired from weightlifting in 1965, Paul took up bowling for a time, and then played golf. 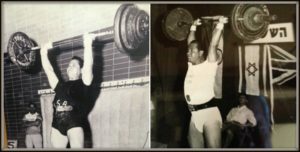 In 1976, he began coaching the Maccabi USA weightlifting team, which took gold in all of their events that year and again in 1981. Maccabi USA sponsors the U.S. Team to the World Maccabiah Games, and supports the JCC Maccabi Games that introduce American Jewish youth to their heritage by sponsoring sports-related programs. “I am very excited about the growing interest and passion among teens here in Tucson for participating in the JCC Maccabi Games. After a very successful trip to Columbus last year, interest and excitement about the program has grown. We expect to have a delegation of 20 athletes representing the Tucson J in Birmingham, Alabama, this year,” said Todd Rockoff, Tucson J President and CEO. “The Ash family is so honored to have the opportunity to sponsor young Jewish athletes, one of whom could become the next ‘strongest Jew in the world,’” said Bruce, who continues, along with other family members, to oversee the Paul Ash Family Maccabi Youth Endowment Fund established by his dad in 1996 at the Jewish Community Foundation of Southern Arizona. Bruce and his wife Jane, who is a member of the Foundation Board of Trustees and Chair of the Legacy Development Committee, also support “Jewish communal life” and the wider Tucson community through their funds at the Foundation. Bruce is President of the Paul Ash Management Company, LLC, which his father Paul founded in 1965 under the name of Nationwide Realty. 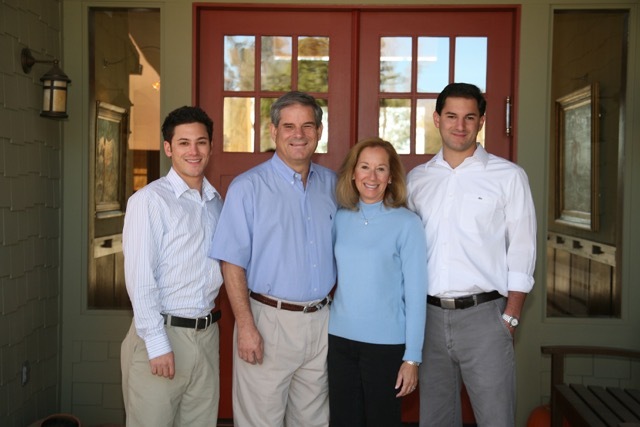 Bruce and Jane’s son Michael is the Designated Broker with the company and their son Matthew and his wife Tessa live in Washington D.C. where Matthew is a communications expert with the Federal Aviation Administration. Michael and his wife Onnie have one child, Bodhi Paul Ash, born in 2016 and named in honor of his great grandfather. Bruce and Michael, along with attorney Greg Gadarian, are working hard to ensure that the ultimate value of the family’s philanthropic funds will meet as many needs as possible in the community.